Minister P. Harrison and State Minister Dilip Wedaarachchi at the meeting. 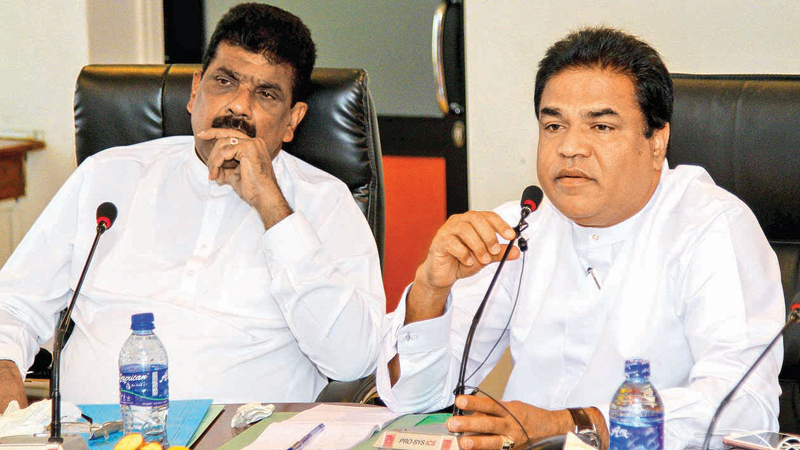 The Fisheries and Aquatic Resources Development Ministry will introduce the GPS tracking system and an identity card for fishermen in order to prevent human and drug smuggling, Fisheries Director General Prasanna Geeganage said. During a recent discussion at the Fisheries Ministry under the patronage of Agriculture, Rural Economic Affairs, Livestock Development, Irrigation and Fisheries and Aquatic Resources Development Minister P. Harrison, the Director General informed the Minister that this decision was taken following repeated requests by Sri Lankan fishermen. According to the DG, drug trafficking, smuggling of illegal migrants and other illegal activities were been carried out under the guise of fishing. He informed the Minister that the fishermen who set out to sea will be required to prove their identity through fingerprint scanning when exiting a fisheries harbour in future. The decision has also taken to introduce a short message service (SMS) within the next two months, to inform the fishermen of weather advisories and other urgent notices. During the discussion, Minister Harrison said he plans to present the a Cabinet paper seeking the approval to introduce the GPS technology, to increase the limit of housing loans provided to empower rural fishermen, and to provide fishing equipment at concessionary rates.